Some production information for the next generation Ram 1500 was offered in FCA’s 3rd quarter financial results, confirming that the 2019 truck will debut in January with production of the all-new pickup starting during the 1st quarter of the year at the Sterling Heights Assembly Plant in Michigan. We have known for some time now that FCA is preparing the next generation Ram 1500. We have seen lots of pictures of the new truck on public roads in heavy camouflage and more recently, new images have surfaced showing the face of the new truck. We know that a new Ram is coming, but we didn’t know when until now. 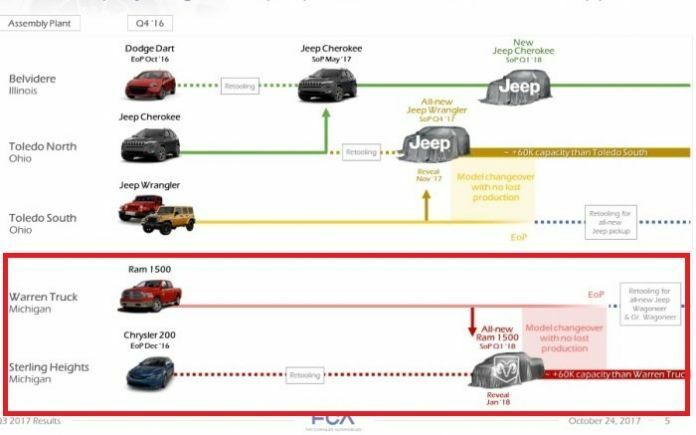 FCA released their 3rd quarter financial results earlier this week and in that long presentation was a chart outlining some upcoming production facility changes. Yesterday we brought you the Jeep news with the production information on the Wrangler Pickup, the Wagoneer, the Grand Wagoneer and the refreshed Cherokee and today, we bring you a look at the future of the Ram 1500. The 2019 Ram 1500 will be all-new, introducing the 5th generation of the popular pickup which once wore the Dodge name. All we know about the new truck right now is that the 2019 Ram 1500 will have a new face, with scaled-down features such as the grille and the headlights. Most significantly, there has been no sign of the familiar crosshair grille on the Ram 1500 test trucks, so it appears as though the next generation half ton Ram will depart from the grille design that has been present since the 1980s. The newest confirmed information on the 2019 Ram 1500 is that it will be revealed in January 2018. The North American International Auto Show in Detroit is in January, so it seems most likely that we will meet this new truck in the Motor City sometime during the week of January 8th. After being introduced in January, the 2019 Ram 1500 will enter production sometime during the 1st quarter of 2018, but rather than being built at the Warren Truck plant where the current half ton Rams are built, the 2019 Ram 1500 will be built at the Sterling Heights Assembly Plant. Sterling Heights used to build the Dodge Avenger and the Chrysler 200, but with those midsized sedans leaving the lineup – “SHAP” will be converted to a truck plant. This change of production location will allow FCA to continue building the 2018 Ram 1500 at the Warren plant while the Sterling Heights plant is retooled to build the next generation trucks. This means that there will be no production downtime and that should lead to full availability of the 2018 models right until the 2019 models hit the street. Of course, when the 2019 Ram 1500 makes its grand debut at the Detroit Auto Show, TorqueNews will be there for a live look at the next gen pickup.